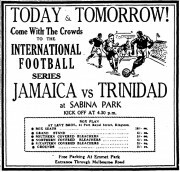 In their last match of the series writes the weekly "Argosy" the Trinidad Clydesdale football team were on Thursday beaten one goal to nil by the Artillery Sports Club. The match was hardly fought out, play at times being fast, and the visiting mean had very hard luck in not scoring; two of three times the goal was at their mercy, and it was nothing but luck that saved the Artillery. For the winners Wishart played a hard, vigorous game, and Evelyn put up the best display at half that he has done for a long while. Cox, albeit he is a Rugby man and not well acquainted with the Association game, gave promise of great things to come, one brilliant run of his raising a good deal of enthusiasm. Richter, at back, came as a surprise. He played a very sure game. His clearances were not always directed with judgment, but they were invariably effective in stopping the attack. Paddenburg at centre forward did not come as a surprise. The Trinidad team had one or two alterations in its make up. G. Brierly stood out, Gordon taking the left wing and Owen coming into the front string. Torrence went back to his old place at centre half and played with a versatility that would have been the undoing of most men. Todd put up a very sure game in goal and saved brilliantly time and again. Thompson, unfortunately, was knocked out early in the second half with a kick over the hip. Dr. Von Wirckler attended him on the ground and he was unable to return.